We’d love your help. Let us know what’s wrong with this preview of Sisters of the Earth by Lorraine Anderson. Sisters of the Earth is a stirring collection of women’s writing on nature: Nature as healer. Nature as delight. Nature as mother and sister. Nature as victim. Nature as companion and reminder of what is wild in us all. Here, among more than a hundred poets and prose writers, are Diane Ackerman on the opium of sunsets; Ursula K. Le Guin envisioning an alternative world in Sisters of the Earth is a stirring collection of women’s writing on nature: Nature as healer. Nature as delight. Nature as mother and sister. Nature as victim. Nature as companion and reminder of what is wild in us all. Here, among more than a hundred poets and prose writers, are Diane Ackerman on the opium of sunsets; Ursula K. Le Guin envisioning an alternative world in which human beings are not estranged from their planet; and Julia Butterfly Hill on weathering a fierce storm in the redwood tree where she lived for more than two years. Here, too, are poems, essays, stories, and journal entries by Emily Dickinson, Alice Walker, Terry Tempest Williams, Willa Cather, Gretel Erlich, Adrienne Rich, and others—each offering a vivid, eloquent response to the natural world. To ask other readers questions about Sisters of the Earth, please sign up. poem text: "I go to the mountains to heal"? Beautiful collection that introduced me to many to authors! A lovely book with a mix of women's personal poetry and stories regarding earth and how women perceive her. Deep and moving, and without the aggressive writing like men tend to view the relationship with earth. Lorraine Anderson did a wonderful job collecting nature-related writings by talented women authors. I savored each page and loved the diversity of choices as I enjoy the diversity in life itself. I loved it so much I looked her up and sent her a message - she said she's coming out with other collections soon. When she does, I'll be sure to read them! This is my all-time favorite non-fiction book ... I absolutely love it. "Christmas in Driftwood Valley" especially ... I think I've read it probably 2 dozen times. the back cover reads in part, "A stirring collection of women's writing on nature: Nature as healer. Nature as delight. Nature as mother & sister. Nature as victim. Nature as companion & reminder of what is wild in us all." this book is all that and more. it's a collection of pieces from more than 100 women poets, prose writers and authors who provide poems, essays, stories, & journal entries which span centuries. A wonderful addition to anyone's library with writers such as Emily Di the back cover reads in part, "A stirring collection of women's writing on nature: Nature as healer. Nature as delight. Nature as mother & sister. Nature as victim. Nature as companion & reminder of what is wild in us all." this book is all that and more. it's a collection of pieces from more than 100 women poets, prose writers and authors who provide poems, essays, stories, & journal entries which span centuries. A wonderful addition to anyone's library with writers such as Emily Dickenson, Alice Walker, Terry Tempest Williams, Willa Cather, Gretel Ehrlich, Adrienne Rich, Louise Erdrich, Zora Neale Hurston, Kathleen Norris, Rita Dove, Julia Butterfly Hill, Barbara Kingsolver, Sue Hubbell, Starhawk and Rachel Carson. Magnificently edited by Lorraine Anderson, with fascinating & intelligent introductions of each new voice prior to their selected piece. I was so moved by this long, beautiful song in women's voices, flowing powerfully from their soft, more nurturing but incredibly strong souls. an outpouring on thought, experiences and love for nature. I was profoundly struck by a continuous refrain concerning the healing power of nature and a call for us to reciprocate. Perhaps Women's Review of Books says it best, "Not only is Sisters of the Earth a pleasure; it is relevant and urgent--politically, aestheticaly and spiritually." a read to relish and return to often. Every author in this anthology has experienced a closeness to the natural world. The entries that speak most profoundly to me offer an experience of wildness in the midst of the ordinary, everyday world. Mary Donahue follows "a V of honkers" to the northland. I have often tried to imagine the world as it looks to flying geese. I wonder where they are going, what it would be like to fly with them. Judith Minty writes of "those cats of mine"; the enigma of living with a creature who is one moment Every author in this anthology has experienced a closeness to the natural world. The entries that speak most profoundly to me offer an experience of wildness in the midst of the ordinary, everyday world. Mary Donahue follows "a V of honkers" to the northland. I have often tried to imagine the world as it looks to flying geese. I wonder where they are going, what it would be like to fly with them. Judith Minty writes of "those cats of mine"; the enigma of living with a creature who is one moment lazing in the sun and a few hours later is stalking prey. A cat will convert a backyard into jungle wilderness. What better way is there to embrace the natural world than to have a cat, the most graceful, exquisite creature in existence, in one's own daily life. So far, I am LOVING this book! A lovely collection of essays and poetry...perfect for when I can only read for 15-20 minutes. I will be exploring Helen Hoover's writing after finding her in these pages! 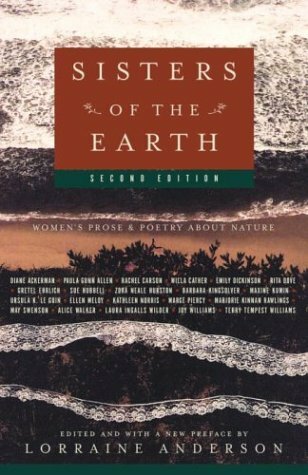 Wonderful book of women's prose & poetry about the earth and wilderness. A woman's love for earth and her bookshelf should have this book!!! I refer to this jewel often. I am certainly adding this to my favorites list. I was delighted to see so many works from times long gone. I for some reason was under the assumption this was modern work only (I never read the description prior to picking it up). What a wonderful collection of writings. And Starhawk! I love her so. I had to read this for a class I was taking in college. I enjoyed a lot of the different poems and authors yet this seemed like such an abridged greatest hits of what could be so much better. I did find a ton of fantastic poems though. An amazing compendium; to be treasured. Easily a top contender for best book read in 2017. This anthology truly opened up a new world of writing to me. I absolutely loved this book, which is a collection of nature writing by American women, mostly from the 20th century. It includes many unique pieces of writing from a wide variety of backgrounds and experiences, all with the overarching theme of the intersection of feminism and ecology - or, women seeking and finding communion with the natural world. In a moment of serendipity, I chos Easily a top contender for best book read in 2017. This anthology truly opened up a new world of writing to me. I absolutely loved this book, which is a collection of nature writing by American women, mostly from the 20th century. It includes many unique pieces of writing from a wide variety of backgrounds and experiences, all with the overarching theme of the intersection of feminism and ecology - or, women seeking and finding communion with the natural world. In a moment of serendipity, I chose to read this collection while I was on a solo vacation in the Southwest, which made the experience even more special. There I was, a woman alone in nature, looking for the same exhilaration and peace that these women were seeking, finding, and writing about. This made for a truly enjoyable read. Sisters of the Earth: Women's Prose and Poetry About Nature is a veritable treasure trove of women's writing on nature. Lorraine Anderson did an outstanding job collecting a diverse group of writers who contributed poetry, prose, short stories and essays to the book. Her thoughtful and illuminating biographies that precede each work demonstrates her palpable attentiveness to each woman's voice. Sisters of the Earth contains this chorus of voices that include well-known writers to lesser known; I Sisters of the Earth: Women's Prose and Poetry About Nature is a veritable treasure trove of women's writing on nature. Lorraine Anderson did an outstanding job collecting a diverse group of writers who contributed poetry, prose, short stories and essays to the book. Her thoughtful and illuminating biographies that precede each work demonstrates her palpable attentiveness to each woman's voice. Sisters of the Earth contains this chorus of voices that include well-known writers to lesser known; I was amazed at the diversity of women found on each page - they include civil/natural rights activists, writers, environmentalists, biologists, poets, and teachers. It's an indicator of the times that many of the women who contributed to this anthology are not readily recognized for their work. For that reason, I consider this wonderful book an indispensable contribution to the (mostly male) canon of nature writing. And despite the inevitable label of "women's writing," this is a deeply humane book. In the book's acknowledgments, I read of a course offered by Stanford; "Women and Ecology", which gives me yet another inducement to pursue some 'non-degree seeking' course work. Some of my favorite classical authors such as Marjorie Kinnan Rawlings, Rachael Carson and Willa Cather are among the more than 100 authors represented in Lorraine Anderson's compilation. Contempory authors include such stand-bys as Terry Tempest Williams and Ursula Le Guin. Of Sisters of the Earth: Women's Prose and Poetry About Nature, it runs the gamut from essays and poems, to journal entries, to short stories and other works of fiction. Sisters . . . "offer[s] a vivid, eloquent response to the natural world" (back cover). This work adds "the world as perceived by women" (p. xvi) in addition to the (also valid) male point of view. First and foremost I love poetry and I even write a little myself. What i really enjoyed about this work was that it covers almost the complete diaspora of nature writing. From historical perspectives, animal welfare, activism to even the space age and our stewardship of our planet. The description almost to microscopic detail of almost all natural biomes eg the Pacific northwest, Prairie and the Canadian wilderness. This is a wonderful book full of beautiful writing. I enthusiastically recommend it; you will find it difficult to tear yourself away from the stories, poems, and essays honoring the Earth. It is well-organized and a multitude of authors are represented. This is certainly the best book of nature writing I've read. This is a treasure of deep ecology from the perspective of women writes from the early 1900's to today. This book is more pose than poetry but well worth exploring the authors that have observed nature, protested against its destruction and found nature as a means to heal. Reading for my Ecofeminist Literature class. Some good stuff, but a lot of it is just pulled from wherever, and there are many incomplete pieces. I prefer anthologies with complete essays/short stories, personally, so this didn't quite do it for me. This book influenced me so much that years after reading it I interviewed the author, and women poets writing about the natural world, for this essay in Her Circle. I have to credit my sister-in-law Jennifer for finding this book for me. It is a very centering book. One of my all-time favorite collections. Wide range of authors and selections. Something to resonate for everyone. Lorraine Anderson is a freelance writer, editor, and teacher whose work focuses on encouraging a way of life in tune with nature. She is the editor of Sisters of the Earth: Women’s Prose and Poetry About Nature and other works on nature. She lives in Corvallis, OR. “Nature offers us a thousand simple pleasers- Plays of light and color, fragrance in the air, the sun's warmth on skin and muscle, the audible rhythm of life's stir and push- for the price of merely paying attention. What joy! But how unwilling or unable many of us are to pay this price in an age when manufactured sources of stimulation and pleasure are everywhere at hand. For me, enjoying nature's pleasures takes conscious choice, a choice to slow down to seed time or rock time, to still the clamoring ego, to set aside plans and busyness, and to simply to be present in my body, to offer myself up.